In tropical countries like India, the heat during the summer season can reach to a point where it is unbearable. In that case, when you step out you’re bound to return home with your skin complexion darker than your original skin tone. You may also have a few dark spots around your face. With increasing cases of tanning, dark spots, freckles, scars, melasma, and other such ailments, there’s a growing need for a treatment that’s effective in reducing its visibility. There are many natural remedies and clinical treatments available. Natural remedies, while effective, take long to ultimately make a difference to your skin. For instant results on skin lightening, clinical treatments are the best; provided they are done by highly-skilled professionals. These treatments are also known of skin lightening treatments. It involves a number of procedures that are suitable for you based on your skin tone and complexity. What are skin whitening treatments? What impact does it really have on your skin? These treatments lighten your skin tone by reducing the melanin content on your skin. When you’re exposed to the UV rays of the sun, to avoid any form of damage to the skin, our skin cells produce the melanin pigment. This pigment is the reason your skin color appears a little darker after a day out in the sun. Skin whitening treatments can be done in both non-surgical or surgical procedures. Then again, it depends on your skin condition, too. 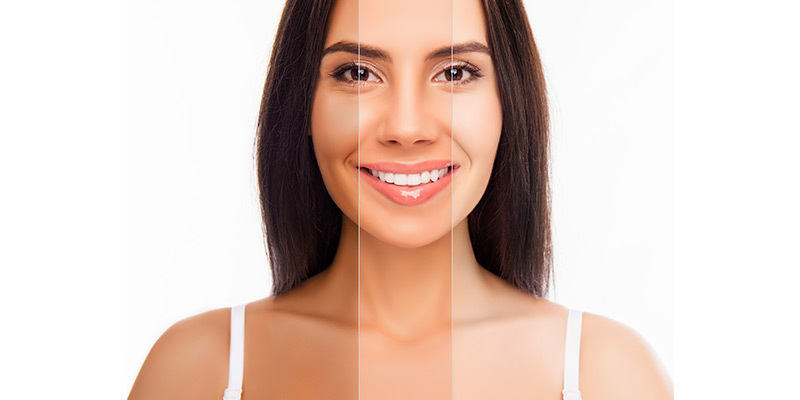 What is the available skin whitening options? The most common and a very effective procedure to remove tan is a laser treatment. A Q-Switched Nd YAG laser is aimed at the area of the skin. This high-energy laser then helps regenerate new cells thereby contributing to a more radiant skin tone. It also takes care of any dark spots, fine lines, open pores, and other such skin problems. The way it does this is by destroying the cells at different layers of the skin, leaving behind a fairer and healthier skin tone. It is the quickest procedure producing very promising results. It’s advisable to go to a well-reputed clinic to get this treatment done. Another effective procedure to remove skin tan, chemical peels are considered as the next best treatment. It removes the damaged top layer of the skin, allowing the healthier skin cells on the lower layer to appear on the surface of the skin. Chemical peels are developed in various concentrations – light, medium, or deep. Apart from removing skin tan, it also gently exfoliates your skin. It is a treatment suitable for all skin types. There are many clinics that can provide chemical peels to treat your skin. But, it is better to have your chemical peels administered through the best dermatological doctor in the country. A form of synthetic scrub, microdermabrasion sprays crystals on the surface of the skin. These crystals remove the dead cells, dry skin and other debris on the layer of the skin thereby exposing a new layer of skin under the outer layer. It exfoliates the skin, unclogs any open pores and boosts collagen generation. Skin whitening injections use glutathione as a skin lightening agent. This lightening agent prohibits the production of the tyrosinase enzyme that produces the melanin pigment. It is assumed to detoxify the body and protects the skin from harmful UV rays. It is used to lighten and brighten the skin against tanning, dark spots, facial pigmentation, and other such skin ailments. It is a non-surgical treatment and should be administered specifically by a dermatological surgeon who has years of experience in skin whitening injections. What is the longevity of skin whitening treatments? Skin whitening treatments can last from a few months to a few years if you follow the after-care regimen prescribed by your dermatologist. Maintaining a healthy lifestyle, regular use of sunscreen, and a basic skin care routine can help the results of the surgery last longer. Furthermore, such skin treatments last longer when they’re done in the hands of the most high-qualified and skilled skin specialists like the ones at The Esthetic Clinics. A world-class center with the latest technological equipment, it is one of the top centers in the country for skin treatments. With one of the best and top dermatological surgeons like Dr. Rinky Kapoor who is the founder of the Esthetic Clinics, your skin is in the best hands. Beat that tan, and visit the Esthetic Clinics for healthier and radiant skin.